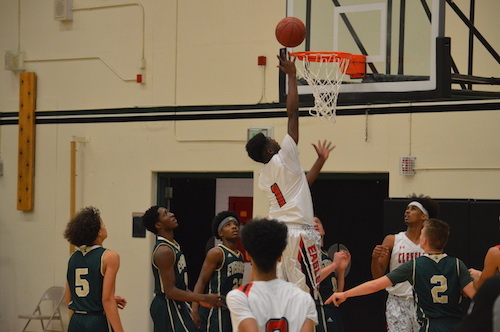 The defending Tournament of Champions champs Cleveland stood one game away from reaching the final round again with the Evergreen Plainsmen. The Eagles jumped out to a sizeable lead in the first half through opportunistic executing from airtight defense. CJ Elleby and Fahad Sharif led the charge with 17 and 12 first half points respectively. 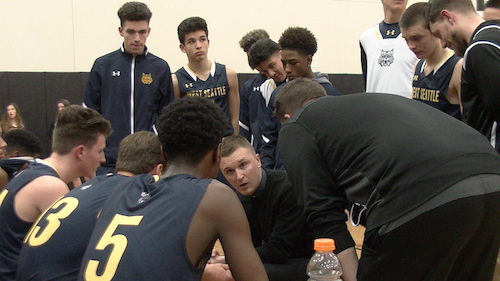 However, the Plainsmen were able to cut the deficit before the break with Trey Ratcliff attacking the basket and willing his team to with 14 of a 31 point second quarter. When play resumed, Cleveland found their groove again and put the ballgame out of reach heading into the final frame. Philip White and Jahleel Breland joined the scoring spree in the second half as the Eagles rolled to a 84-66 win. Can Jerry Petty lead his squad to back-to-back tournament wins? Cleveland 84, Evergreen (Vancouver) 66. Coming off a 6th place finish in state last season and winners of the 2015 Tournament of Championship which they will look to defend their crown this week at Franklin High School, Cleveland Eagles Head Coach Jerry Petty joins Steve Dion to discuss this year’s squad and how his team is focused on battling against the great competition in the Metro League this year. The Braves started the season 15-0 and hosted Cleveland on Friday night to extend their undefeated streak. Listen as Nic Beckman provides an audio recap of the match-up including post-game comments by Blanchet coach Greg Bruns! Jadyn Bush and Taylor Chambers led the Braves with 19 and 10 points respectively as Blanchet extends their undefeated 2015-16 campaign with 16 straight wins to start the season. The home team set the tone early with an 11-0 run which featured tough defensive efforts by Jilese Bush and Bella Kemp in the paint. This led to a series of transition buckets that helped build a halftime lead Cleveland could not surmount. 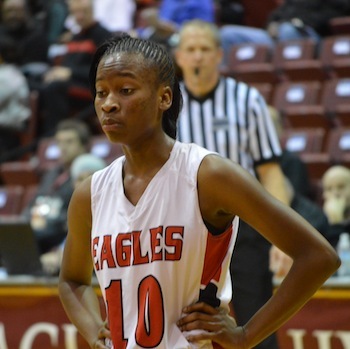 Monique Bungay finished in double figures for the Eagles scoring a dozen in the contest. Coach Greg Bruns was able to utilize the depth on his talented roster and as a result eleven Braves were represented in the scoring column. In his postgame comments, Coach Bruns stated, “We want them all to play hard, we want all to do the same things if you’re a starter or not.” When asked about the strong start and what lies ahead for his team he replied, “We’ve got some tough games coming the next couple weeks, so we want to really focus and get better.” As a result of tonigh’s win, Coach Bruns earned his 100th victory as a Washington high school basketball coach. His response to what this means? “It’s an accomplishment, but it’s about these kids. To start the year 16-0, it’s never happened in my career. Obviously, it’s a testament to what they are and they’ve acclimated to me as a coach.” Bishop Blanchet certainly appears to be on track as a contender in early March with tonight’s convincing victory serving as further evidence of this team’s strength. Bishop Blanchet 70, Cleveland 33. Championship Saturday at the Tacoma Dome tipped off with a matinee of the 3A girls title game with 2-time defending champs Cleveland and newcomer to the classification recently from 4A in the Lynnwood Royals. It was a remarkable accomplishment that Coach Redd led the Eagles to the final in her first year with the program and major turnover of the roster. Similarly, Coach Edwards has put together a powerhouse that appears to have the pieces to return to the TDome for years to come. The Eagles knocked off familiar foe Bishop Blanchet to earn a spot in the championship game while the Royals took down Bellevue in the semis. In a clash of old guard against the new kid on the block, which squad would raise the hardware? 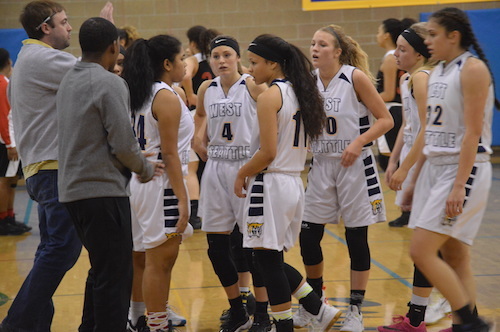 Lynnwood’s versatile wing Mikayla Pivec kick-started her monster game early by scoring the first dozen points for the Royals which included crafty turnaround jumpers in the paint. Her rebounding prowess was also shown in the opening quarter as the path to a double-double was paved early. The Eagles countered with Aqeelah Williams who continued to heat up as the first half moved along. Pace of play increased in the second quarter and Cleveland benefitted as Jayde Christopher controlled the game speed nicely. Back to back triples by the Giavanni Flowers and Williams pushed the Eagles lead to 27-19 at 2:45 which prompted a Royals timeout. LHS used the remaining minutes of the first half to cut the deficit in half and return to the locker room with a 29-25 score in favor of Cleveland. When play restarted, Lynnwood used a 6-0 run in under three minutes to make another lead change of the contest in which there were four. This proved to be a turning point in the game because Cleveland went on a major scoring drought which lasted the entirety of the second half. Shots rimmed out and with each miss seemed to dash the confidence of the Eagles. A field goal percentage of 16% in the final sixteen minutes of the game put CHS’ fate in the balance. Lynnwood’s 12-4 scoring edge in the third quarter put them in a good position to secure the victory. Jordyn Edwards and Kelsey Rogers maintained the Lynnwood momentum by using their defensive pressure to set up offensive production. The pair combined for six defensive rebounds, five steals, and four blocks to keep the high-flying Eagles at bay. Leading 44-36 with a shade under four minutes to go, Cleveland needed a spark. Myla Hightower answered the call by willing her team to rally and extend the contest. The bulk of her nine points were scored late to cut the margin to a two possession game. A few more defensive stops could make things interesting. However, Pivec eliminated any chance of a comeback by converting on back to back possessions with tip-ins under the cup. These baskets quelled any chance of Lynnwood relinquishing their lead and helped the Royals run the clock down. Before the clock hit triple-zeros, Coach Edwards checked Monty Cooper in who sprained her ankle the day before. The senior limped onto the court and found a spot twelve feet from the basket. In the waning seconds, she received the rock and took the hoisted the final shot of the game. Swish! 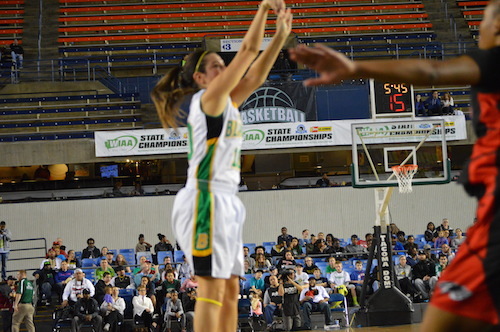 Lynnwood storms the floor as one of their leaders ends her high school basketball career in a perfect way. The Royals are the new 3A champions. The first semifinal to determine a championship game berth in the 3A girls classification featured a rematch of last year’s title contest between two-time defending champ Cleveland and the Braves of Bishop Blanchet. The Eagles have put together an impressive run thus far considering the group of seniors that graduated last season and the passing of the head coach torch. 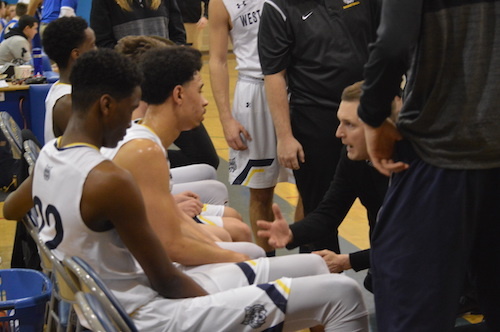 Similarly, Coach Willison has done an excellent job of bringing Blanchet back to a deep tourney run with a young squad. 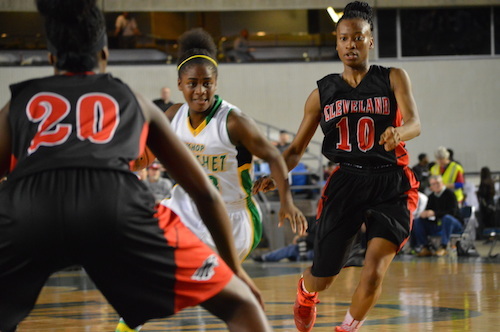 Cleveland jumped out to an early lead as Jayde Christopher and Aqeelah Williams used their backcourt pressure to produce turnovers and points on the other end. They held BBHS to a half dozen first quarter points in the process. As the first half progressed, the tides turned and Jadyn Bush was a main reason for the comeback. The sophomore got tough buckets to fall and was aggressive on the boards. She finished with a team high 19 points and 10 rebounds. At the break, Cleveland led 24-21. When play resumed, the Braves strung together a roll that last the duration of the third frame. Bella Kemp was a main factor in the momentum swing when she notched 11 points and 9 rebounds. The 36-32 Blanchet lead accounted for the first lead change of the game: would there be another? 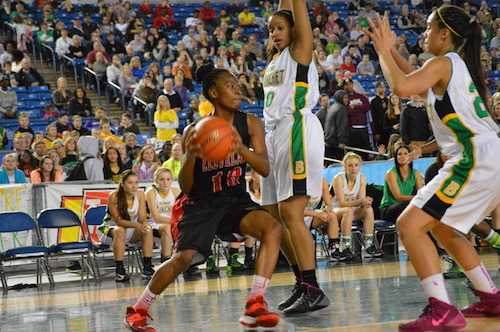 Joyce Harrell made her post presence felt as the senior heated up in the paint. Just as Harrell was in a groove, she was sidelined for a spell with a knee injury. Upon her return, the Eagles continued a 23-12 run in the fourth quarter that eventually sealed the game. Williams scored 25 in addition to 9 rebounds as Cleveland knocks off a familiar foe once again and is now one game away from a three-peat. 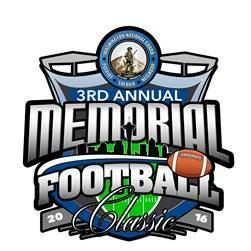 Saturday vs. Lynnwood at 3pm! Bishop Blanchet takes on the top team in the state in the 2014 3A State Championship Game. Blanchet made it an all Metro League Final. Myzhanique Ladd poured in 16 points in the final game of the season. 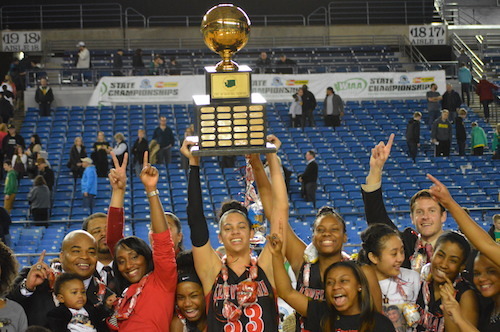 Both the girls 3A and boys 3A state championship games featured teams from the Metro leagues in Seattle. This girls state championship game saw the Cleveland Eagles, undefeated in the state of Washington and 23-2 overall against the 20-4 Bishop Blanchet Braves. They faced off earlier this season just one time, resulting in a 65-50 Cleveland victory. Cleveland won the state title last season over the Seattle Prep Panthers and the Eagles returned four of their five starters from that team. They were clearly the title favorites going into the year, and their perfect in state record kept them favorites in this matchup. Led by 11 points from star guard Makayla Roper in the first quarter, the Eagles jumped out to an early lead. With balanced scoring the Braves closed the Eagle lead to six going into the second. With Roper not scoring a point in the second frame, the Eagles were still able to extend their lead. Myzhanique Ladd picked up what Roper left behind, adding seven points in the second to take a 33-25 lead into halftime. The scoring dramatically slowed on both sides in the third quarter. Just six points from the Eagles allowed the Braves to get back into this ballgame. Great defense on both sides sparked the lack of offensive production. Blanchet cut the lead to four entering the fourth. Blanchet continued to battle with the mighty Eagles in the final quarter. The lead was five for Cleveland with three minutes to play. Ladd was fouled on a coast to coast layup attempt and hit one of two to put the Eagles up six. After a Blanchet miss, Jayde Christopher converted on a layup to extend the lead to eight with under two minutes to play. After a Braves turnover Ladd added a floater to go up ten, effectively ending the game. This makes back to back titles for the Eagles, and three in the last five years for Coach Stephenie Wheeler-Smith. 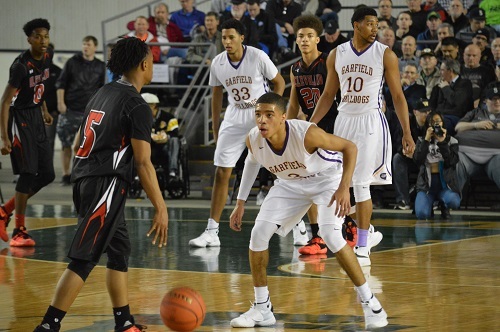 Garfield High School played host to the boys and girls 3A championship games for the Metro League tonight, the first of two the girls game featuring Cleveland and Bishop Blanchet. Cleveland won this game last year over Seattle Prep and eventually won the state title. 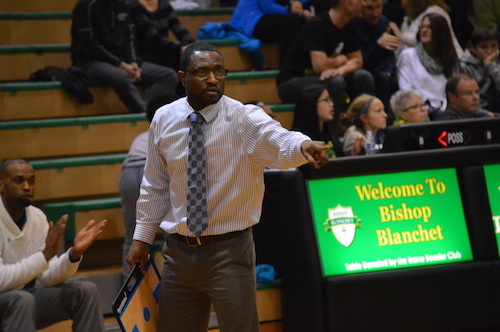 Bishop Blanchet is a team on the rise that seems poised to be in contention for years to come. 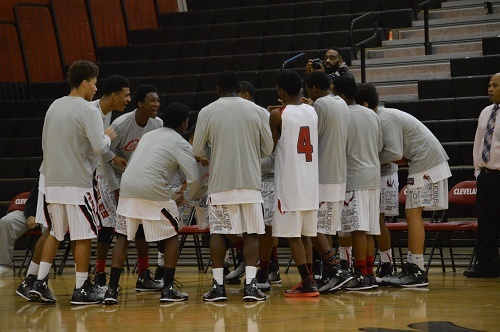 Would the Eagles repeat as Metro champs or would the newcomers shock everyone at the GHS gym Friday night? The first half was back-and-forth as Bishop Blanchet traded three pointers from freshman guard Taylor Chambers with buckets from Cleveland’s variety of scoring options. It appeared we were set for a high octane game as the first quarter score read 21-19 in favor of the defending champs. The Eagles eventually found their groove of suffocating defense in the second quarter as a number of turnovers in the backcourt on successive possessions resulted in a growing lead for CHS. When playing Cleveland, it is understood that field goals count for twice as much because they score in bunches. At the half, Cleveland held a double digit lead. Bishop Blanchet caught their opponent on the heels early in the third quarter as the Eagles’ lead was cut to six midway through the frame. Jaydn Bush played solid on both sides of the floor as the freshman blocked several shots as well as made several buckets for the Braves. 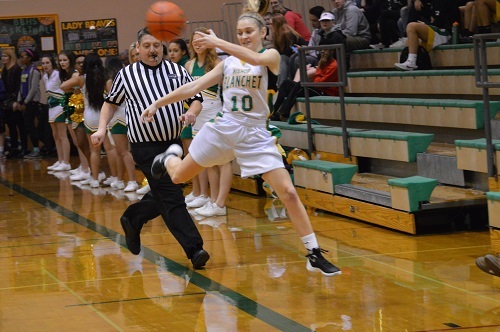 Blanchet battled throughout the game, but Cleveland is the defending state champs for a reason as senior Makala Roper buried several clutch shots down the stretch to put the game out of reach for the challenger. When the buzzer sounded, the Eagles raised the hardware for the second consecutive year by the final score of 65-50. After first round byes, Cleveland will face the winner of Liberty/Seattle Prep and Bishop Blanchet will take on the victor of Juanita/Holy Names in the first round of the SeaKing district playoffs. 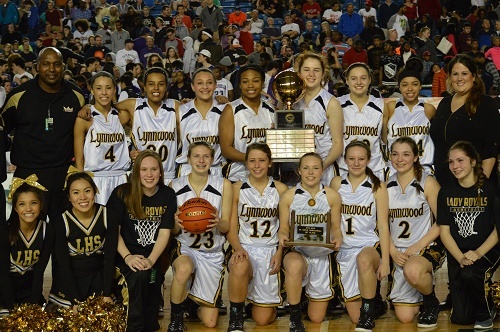 The first day of 2014 granted high school hoops fans a great New Year’s gift in the form of a matchup between undefeated Lynnwood and defending 3A champions Cleveland. It was evident that this game was the place to be in Seattle on Wednesday night because the Eagles gymnasium was packed. The line to enter extended outside the school and did not shrink until the second quarter. The stage was set for a showdown between two of the top girls basketball programs in the state. Lynnwood jumped out to an early lead by knocking down shots from the paint. The Royals were able to move the ball well in the half-court offense and set up high percentage scoring opportunities. The host Eagles were able to keep pace and trailed LHS by three after one quarter. The second quarter completely changed the complexion of the game. The Royals shots stopped falling and Cleveland’s pesky defense translated to points on the other end of the floor. Alexia Mefi’s blocks brought the capacity crowd to its feet. The Eagles outscored the Royals 16-3 in the second quarter and led 27-17 at the break. CHS picked up where they left off in the third quarter as senior Makayla Roper drained four field goals in the frame. The deficit increased as the fourth quarter commenced with a 46 to 28 lead in favor of Stephenie Wheeler-Smith’s squad. The contest garnered some interest in the fourth as Lynnwood was able to extend the ball game and get to the free throw line. The Royals were able to cut the Eagles lead to eight points late, but Cleveland held on to pick up a 59-49 victory. In a rematch of the Metro championship, the Seattle Prep Panthers faced off against the Cleveland Eagles. Cleveland began the game on a 13-4 run, controlling the pace of play and executing in transition. The Eagles stifling defense held the Panthers to just six points in the quarter, and Cleveland took a 13-6 lead into the second. The Panthers still couldn’t get their offense on track in the second quarter. Six turnovers in the period for the Panthers and again they scored just six points; give the credit to the full court defense by the Eagles and not allowing Prep to use their size in the interior. Cleveland also struggled from the field in the second, committing five turnovers and making just two shots. Cleveland took a 21-12 lead into halftime. The seal was removed from the basket for the Panthers in the third. Prep controlled the quarter and outscored the Eagles 15-4, crashing the offensive glass and capitalizing on second chance points. The Panthers zone began to cause Cleveland problems, forcing the Eagles into deeper contested shots that did not fall. Senior Holly Tonry led the comeback for the Panthers with a quarter high six points. 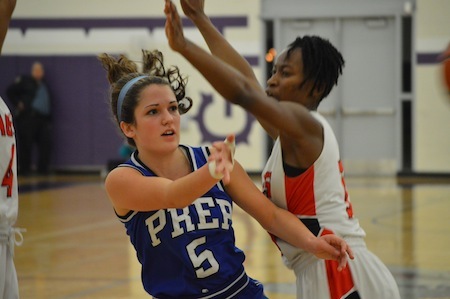 Prep took their first lead of the game on a three by junior Mary Ann Santucci, and closed the quarter ahead 27-25. The final quarter was close throughout, with the lead changing hands multiple times. Prep struggled again from the field, making only two shots in the quarter, both from Tonry. Cleveland snagged the lead from the Panthers with a free-throw from Myzhanique Ladd, 35-34 with 1:46 remaining. Prep answered with two free-throws from senior Michaela Carew, taking the lead back with 13 seconds to play. Ladd drove on the final Eagle possession, got fouled and went back to the line. She sunk both free-throws with five seconds left and closed out the contest, 37-36. The stakes were high in a rematch of their December fifth meeting; the winner to take the #1 seed into the Sea-King district. Cleveland topped Prep by five in their first contest, 42-37. Seattle Prep started in a defensive 2-3 and occasional box and one zone, catching the Cleveland Eagles off guard and holding them to just eight first quarter points, all by Makayla Roper. Prep took the lead after the first 11-8, led by senior Michaela Carew with seven. Turnovers plagued the Panthers in the second quarter, losing the ball five times compared to Cleveland’s two. Cleveland began the quarter on a 12-2 run, led by junior Alexia Mefi with seven points. Prep’s Mary Ann Santucci kept the Panthers in the quarter with her first five points of the contest to cut the halftime lead to just four, 22-18. The third quarter saw back and forth scoring, with the Eagles maintaining a slight lead. Carew led the Panthers again in the third with eight points, while five Eagles scored field goals in the quarter. Cleveland took a 36-31 lead into the final period. Both teams maintained their excellent defense in the fourth quarter. Each team forced five turnovers and neither team was able to get into an offensive rhythm. Carew went down early in the fourth with an ankle injury, but Prep continued to battle without their leading scorer. 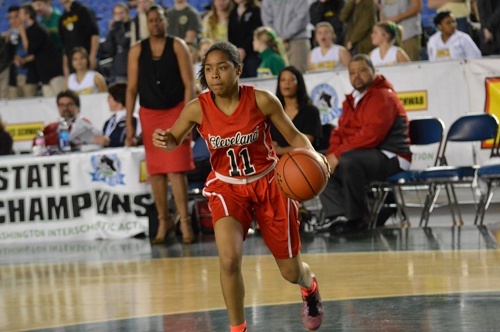 Clutch baskets down the stretch by Eagle junior Alexia Mefi secured the win for Cleveland, 43-40. The matchup between two of the best girls teams in Washington State ended in a blowout, with the Cleveland Eagles beating the Holy Names Cougars by a score of 63-30. This game pitted two 17-2 teams and what seemed to be the elite of the incredible Metro League head to head on Senior Night at Holy Names. Cleveland started the contest on a 10-0 run, forcing nine first quarter turnovers and capitalizing on transition baskets. The Eagles distributed the ball well in the first quarter, with six of their players scoring in the period. Cleveland did not lay off the gas in the second quarter. The same six players each scored again in the second, moving the ball well and keeping the Cougars off balance giving the Eagles wide open looks. Cleveland called full court defensive traps early in the first and second quarters, forcing turnovers and catching Holy Names on their heels. When Holy Names did get the ball up the floor, their half court sets were rushed and out of sync. Credit the relentless Cleveland defense in the first half for forcing 18 turnovers and giving up only 18 points. With their big lead, Cleveland sat in a 2-3 zone for a good portion of the second half, not pressing or trapping on defense. The Cougars attempted to get back in the game by taking deep three pointers, but only converted on two of them in the second half. Watch out for Cleveland (18-2) come tournament time, they beat #1 ranked Wilson in the King Holiday Hoopfest and obviously handled a very good Holy Names (17-3) easily on Friday night.